Podręcznik do samodzielnej nauki praktycznego zastosowania kolokacji. 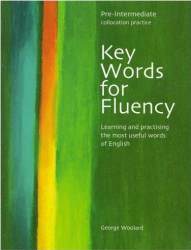 KEY WORDS FOR FLUENCY is a new series of collocation practice books. Fluency does not depend on knowing many thousands of difficult words. It depends on being able to do a lot with your basic vocabulary. Fluency in reading, writing and speaking depends on knowing thousands of collocations. Listening also depends on recognizing collocations. KEY WORDS FOR FLUENCY is the first self-study to recognize this.